Saturday- We left the Elks Lodge and drove through the toll both in Sault St. Marie on the American side, $12 cash only. We stopped at the Canadian Immigration booth. The guard asked where we were going, when we were leaving, what we were taking with us(household goods), how much alcohol, ( 8 bottles of beer and 2 bottles of wine), if we had been to Canada before and if we had any fire arms or had a firearm license. We sailed right through. We continued onto CA 17, which is the Transcanada Highway. It was four lanes for about 20 miles. It took a short while to get used to Km again vs miles per hour, but we quickly adjusted. Since the road goes along the lake we thought we would have pretty water views like we had yesterday, but we did not. Most of the road was in good condition, but there were some poor patches, just like in the U.S.
We stopped for the night at the Walmart Super Center in North Bay Ontario. The temp was 95 and humid! We did not expect that the temp would be so high! We parked between another motor home and an 18 wheeler. Bob disconnected the car and went looking for the Guest Services office for the mall. The Walmart was located on one end of the mall and we were parked in front of a parking garage. I stayed in the MH with the generator going to make sure that the MH stayed cool. Bob returned, saying we have a problem. They are repairing the parking lot and and are not allowing RV’s to spend the night. By this time the other MH and the truck were gone. So we went to look at the Elks parking lot. There was a wedding reception going on and there were a lot of cars, but people were just starting to leave. The bartender took us to the basement members lodge, where we were greeted with open arms! There were 12 people there and each one introduced themselves and shook our hands. They said we were welcome to stay and could hook up to their electric( 15 amp). We gave them a $15 Canadian, donation They invited us to have a drink. We returned to the MH and moved into the parking lot, right next to the building. Then we went back downstairs to the bar and Bob had two beers. Canadian beer has a higher alcohol %, so Bob was feeling no pain! The bar closed at 6, so we returned to the MH and ate dinner. We were able to get satellite, so we watched some TV and went to bed. Sunday- Happy Fathers Day! Bob walked the dogs and discovered that there were 4 RV’s in the Walmart parking lot. He was angry! We went to the Lodge for the pancake breakfast which was a fund raiser for their kids charity. We left and continued east on the Transcanada Highway. It was very hilly, which surprised us. Before we arrived in Ottawa, a MH pulled out. in front of us. The speed limit was 55 mph, and the driver did 40 mph. He could not drive his MH and had traffic backed up for miles. We were right behind him on this two lane road. Finally, Bob was able to pass him. The road did finally open up to four lanes as we traveled closer to Ottawa. Then the drive became awful! There was a lot of traffic and the GPS told us, NUMEROUS times, to be in the left lane for our exit. When we arrived at the exit it was to the right. People, of course, were angry that we were in the left lane, even though we were doing the speed limit. They would go around us, cutting us off, almost hitting the front of the MH. We were also shown a middle finger several times. What a mess! Terrifying! Since we missed the turn off, Bob continued on the route, as we did not have reservations and I found a different RV park on the east side of Ottawa. I re-routed us to Camping Hither Hills,an odd name. This was a Good Sam park, and the same price as the place we had planed to go. We pulled into a 50 amp, FHU back in site, with our Good Sam discount, it was $42 Canadian. We ran to an ATM and withdrew Canadian money, giving us $100 Canadian for $ 81 USA, including the fee. I like that! We returned, and were able to use the WiFi. We went to dinner on Elgin Street, downtown at the Elgin Street Diner. The food was okay, but I would not return.We returned to the MH and watched TV before bed. Monday- We left and drove downtown. What a mess! 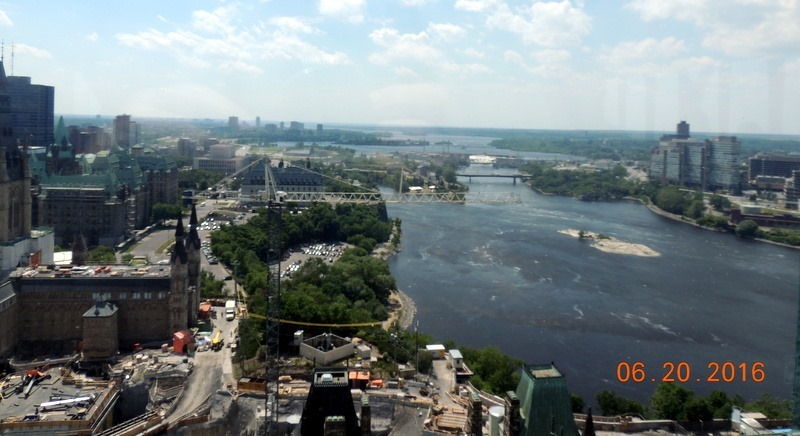 Ottawa is under construction. EVERYWHERE! It was horrible traffic and one way streets, always going to the wrong way! Plus, they rarely allow right or left turns. It makes it very hard to go around the block! 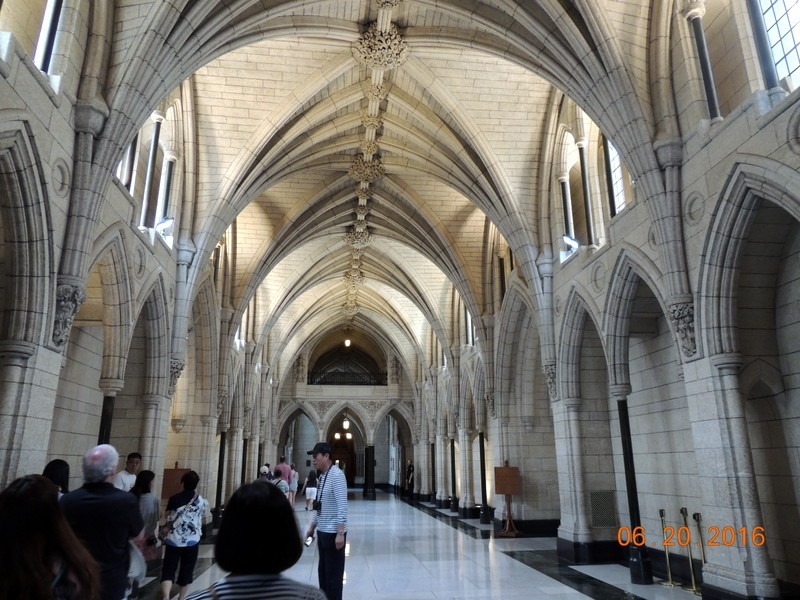 I dropped Bob off to get our tickets( free) for the tour of Parliament. The website was poor, and did not tell us anything about the tour, other than to pick up the tickets at 90 Wellington Street. Because of the traffic and construction, we had trouble finding the address. Bob walked around and I went around the block, then stopped and picked him up. Finally, we went to a parking garage and parked ( $5 for 1 hour). We walked up and found the ticket office. The employee immediately spoke French to us, and we spoke back in English. He switched immediately. The first available tour was at 12:50, in English. 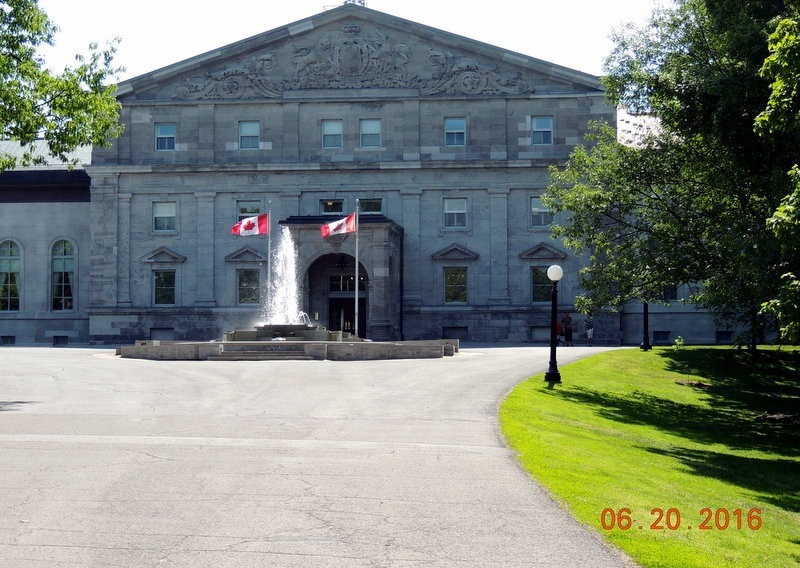 So we returned to the car and went to our second stop, Rideau Hall. 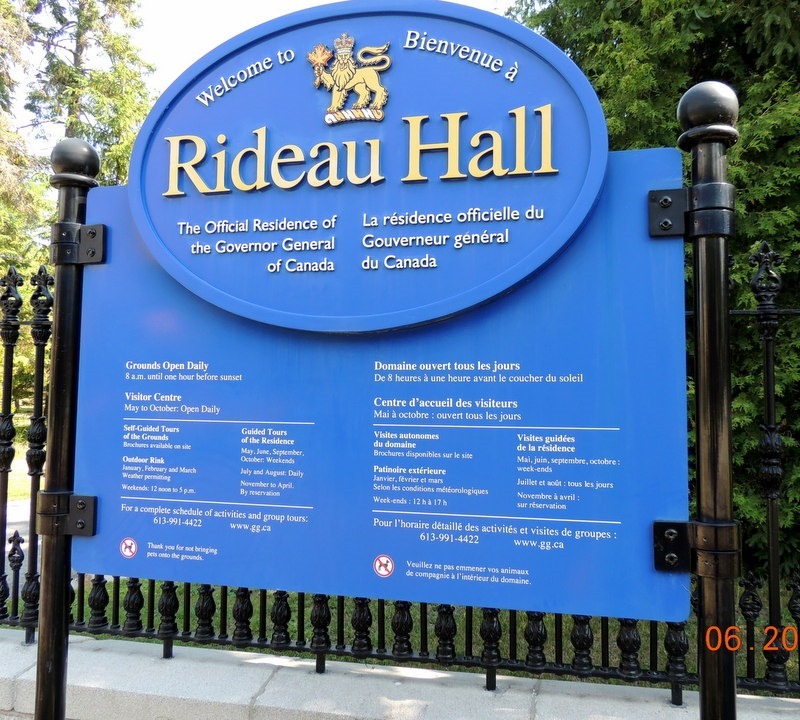 “Rideau Hall is, since 1867, the official residence in Ottawa of both the Canadian monarch and his or her representative, the Governor General of Canada, and has been described as "Canada’s house". From their website. The Governor General represents The Queen in Canada and exercises the responsibilities of head of State on behalf of Her Majesty. He is also the Commander-in-Chief of Canada. We found a parking space and parked in the shade, on McKay street and entered through the open gate. We walked into the grounds. Above is the main entrance to The Residence. The building is huge. This entrance is the public area, where the tours are done. Also, these are the public rooms, where parties/receptions etc. are held. The next area is the royal area, where housing for visitors is located. Then the family area, then the offices. We only saw this part. There were no tours today of The Residence, because of some event. 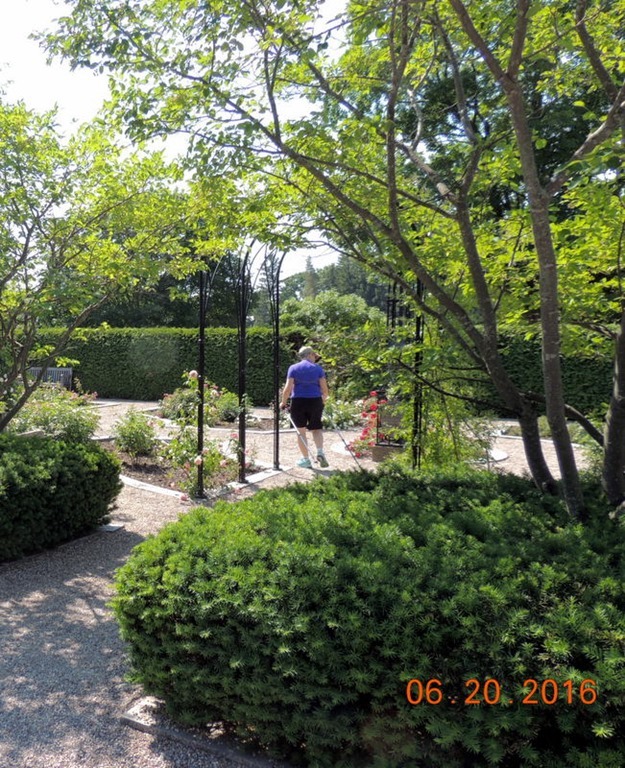 We were allowed to just roam on the grounds, which are extensive. We went to the house, then to the gardeners cottage, which is where the Visitor Center is located. 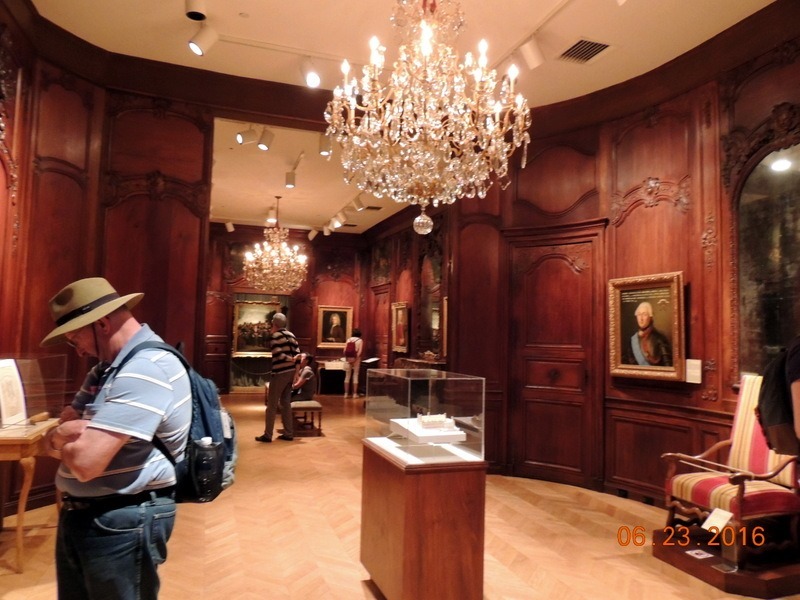 We spoke with the Docent, and looked at the exhibit. 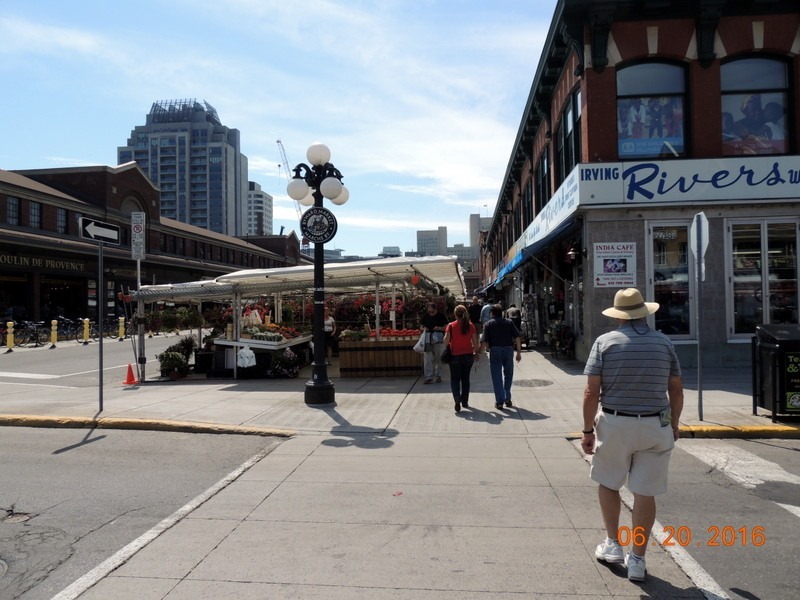 We left and went to Byward Market. 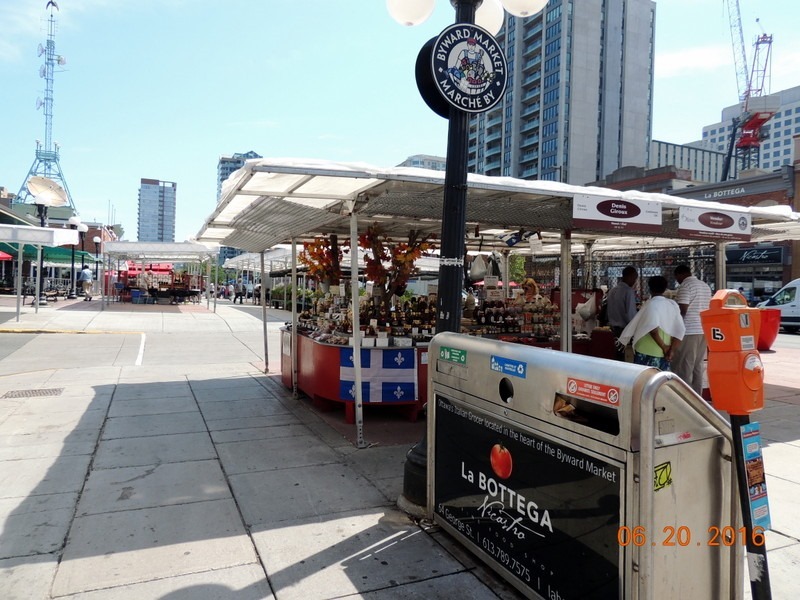 We were very disappointed, as the market only had a few food and plant vendors. The rest of the area was restaurants. 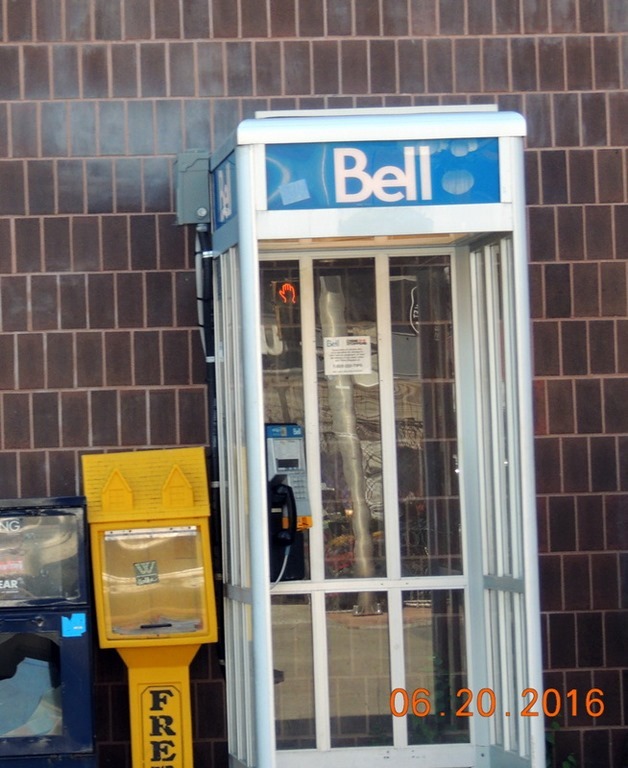 Yes, a real phone booth. We don’t see these anymore! There are a number of them all over the area. We left at 11:10 and it took us until 11:50, to get back to the parking garage. Again, traffic, construction and no turns. We parked and went to the Food Court in the building for lunch. 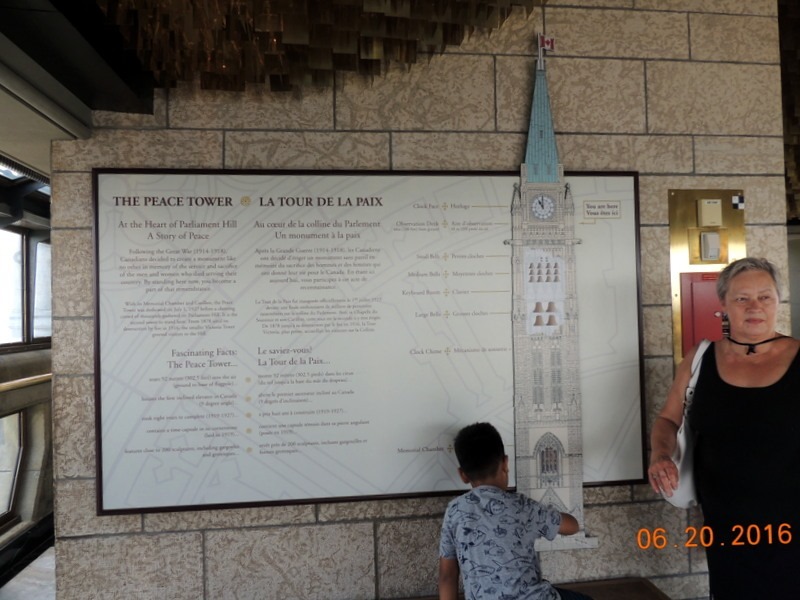 We walked up to Parliament Hill for the 12:50 tour, arriving at about 12:30. 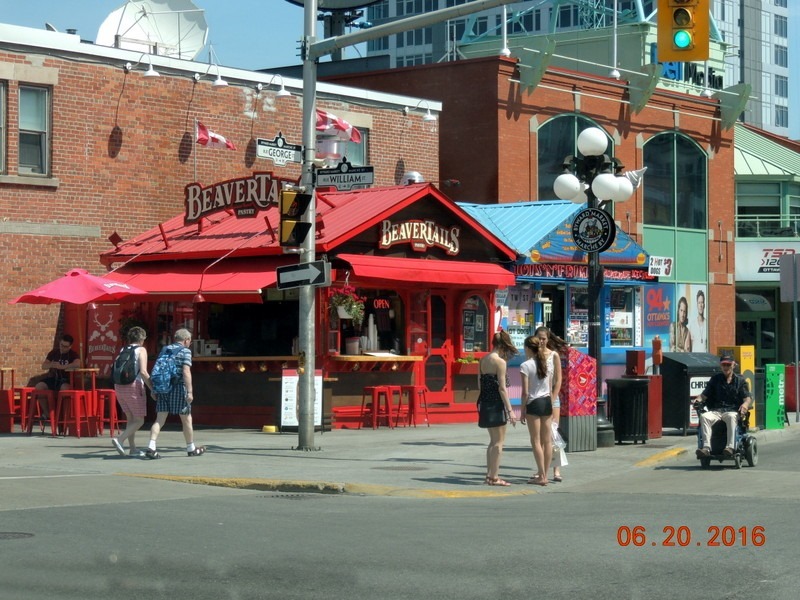 The stage in front of the building is for the Canada Day celebrations, July 1. 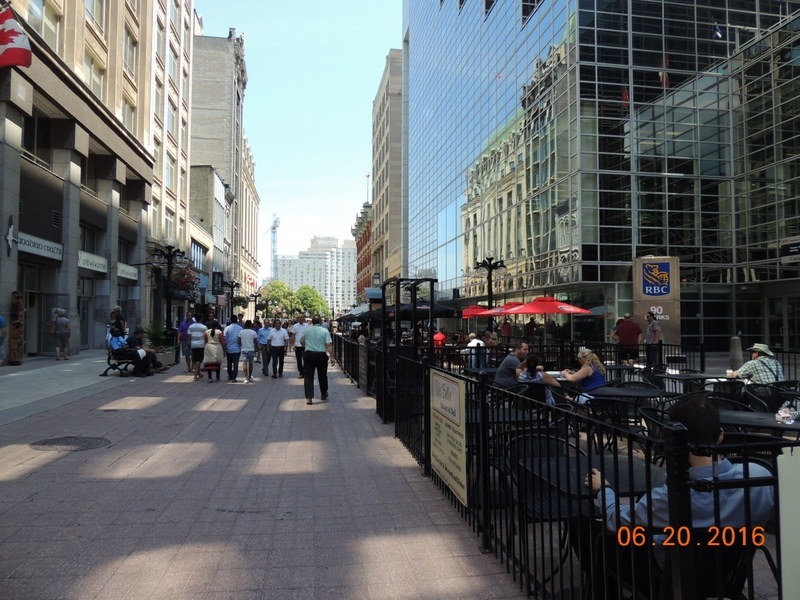 We walked past the Court Building, and there is this pedestrian walk with restaurants. People protesting that there is a change being made to their benefits, above on R.
Our plan was to walk along the sidewalk on the river, behind the building, but due to construction, we were blocked from doing that. There were these cars parked out in front. There was an information person wandering around answering questions. She did not know who was there, but it turned out to be Prime Minister Justin Trudeau, for a press conference. 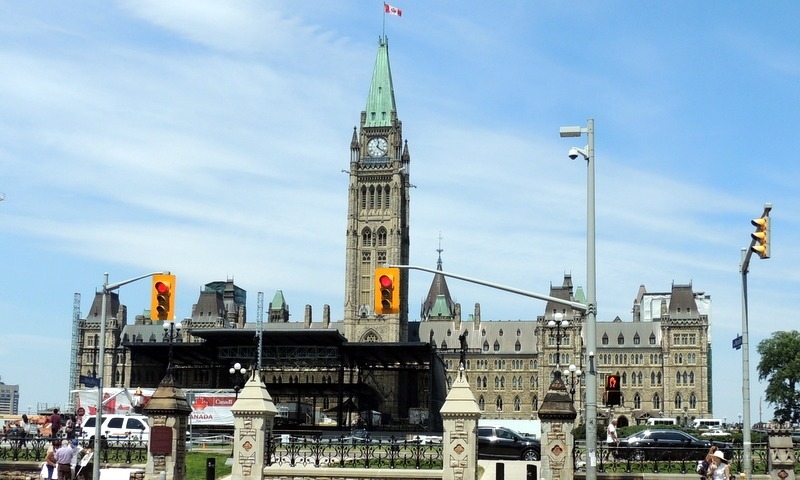 The press conference was being held in front of the house of Commons, so we were unable to visit that area on our tour. We saw all the reporters, but the conference did not start when we were there. We waited in the shade until the tour guide came out. She was a little late and it was hot and very windy, with lots of dust flying. 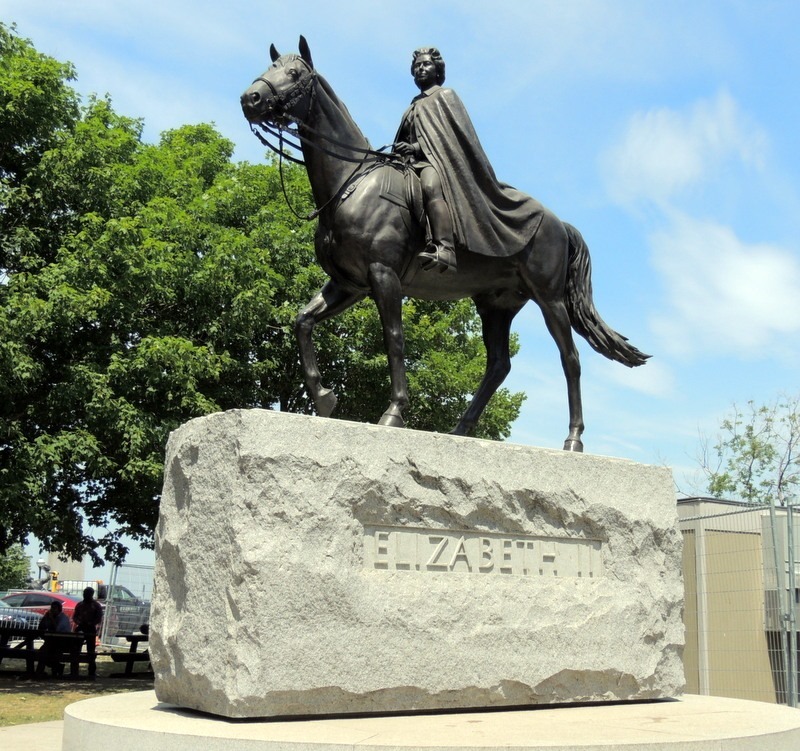 Below is a statue of Queen Elizabeth. We went through security, in two places. They patted me down due to my knees setting off the metal detector. We even had to take off our Fitbit’s! The tour was 45 minutes. We started at the House of Commons. Currently, the liberals are in charge and they sit on the left. The Conservatives on the right. The House of Commons is elected. 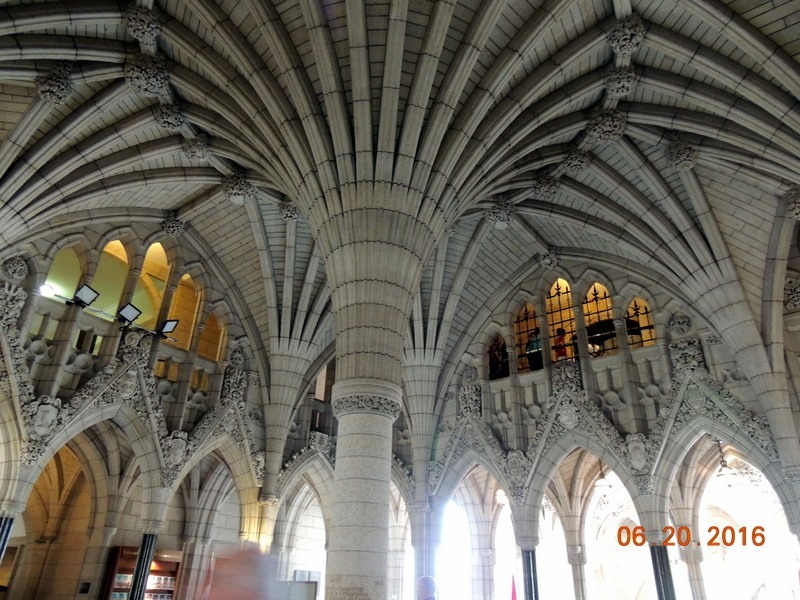 Above is the entrance to the Library, which houses law books used by the Legislators. It is the only original building still standing. There was a fire which destroyed the rest of the building. 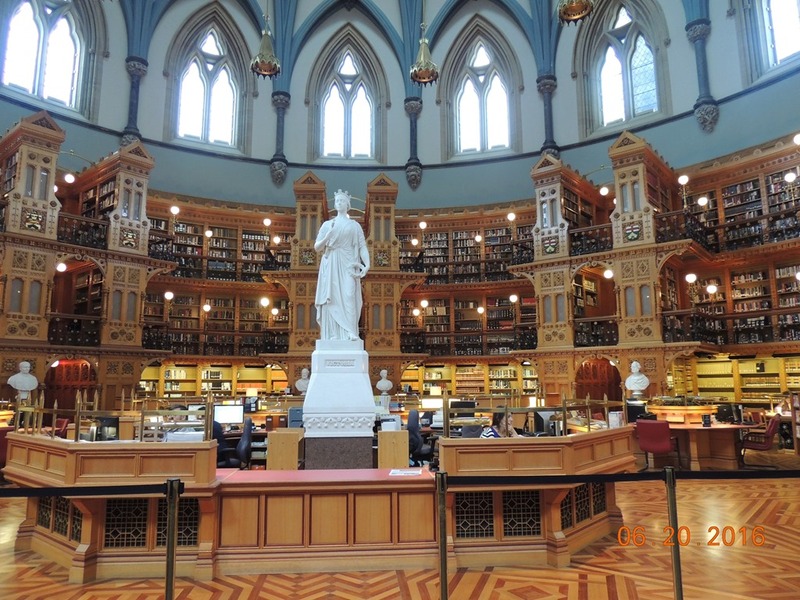 There are steel doors which were closed when the fire occurred, saving the beautiful, priceless library. 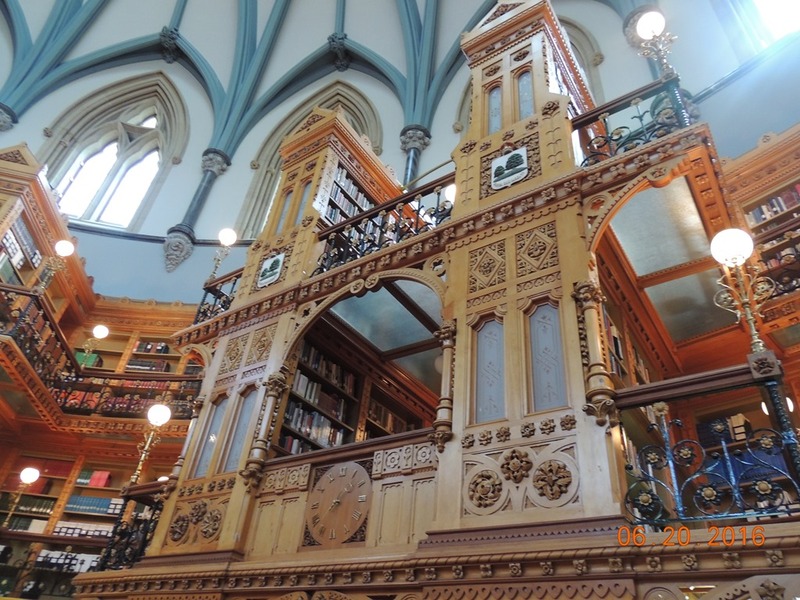 The library is spectacular. The wood work and the floors are beautiful. 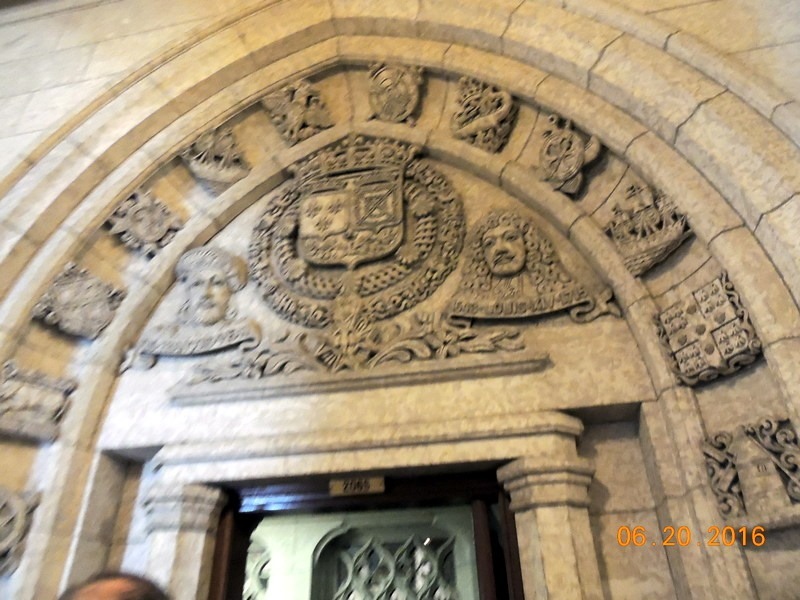 Below is the entrance to the Senate. 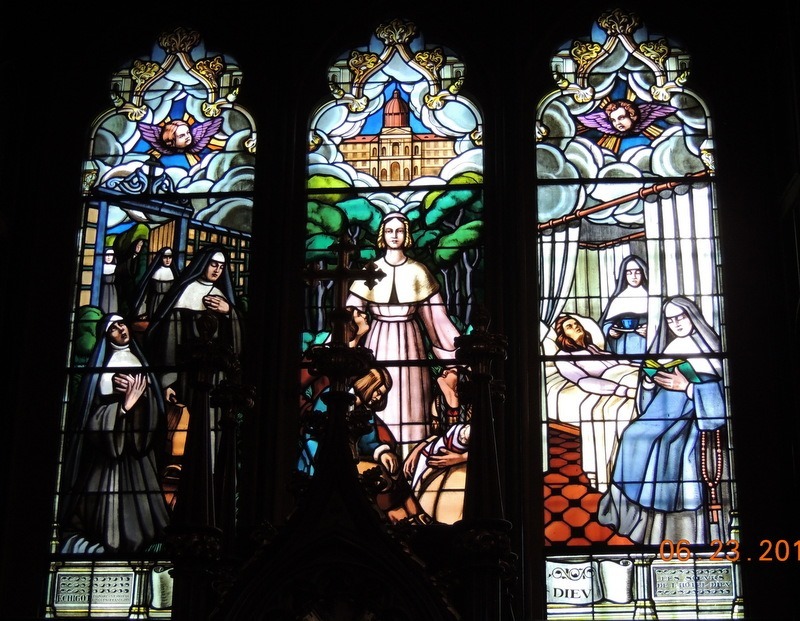 The stain glass window has Queen Victoria on the left and Queen Elizabeth on the right. 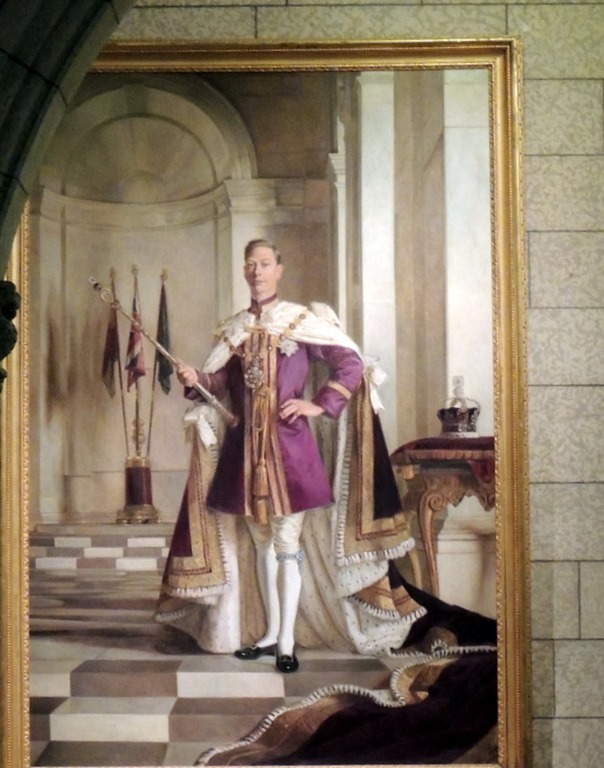 The scepter that is below the window is a replica of one that is brought into the Senate when the legislature is in session. 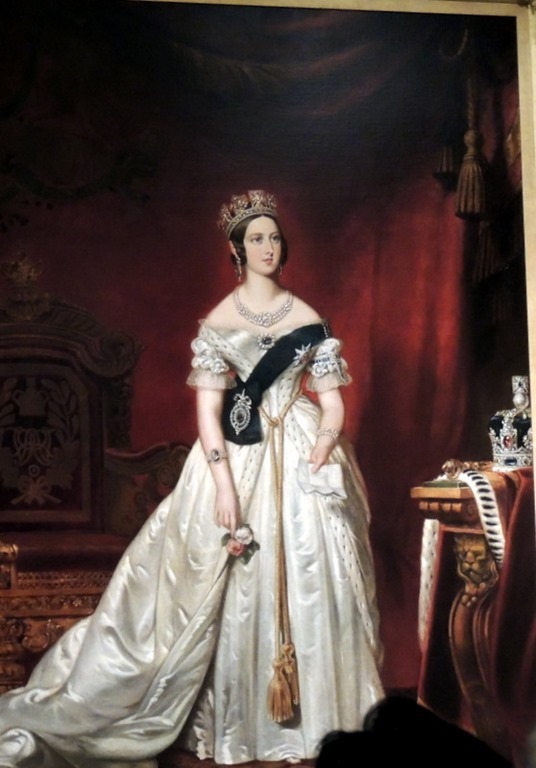 The picture of Queen Victoria, in the center, above was removed by cutting it out of its frame when a fire occurred. This has resulted in the train on the dress being cut off, but at least the painting was safe. That is King George on the right and Queen Elizabeth on the left. 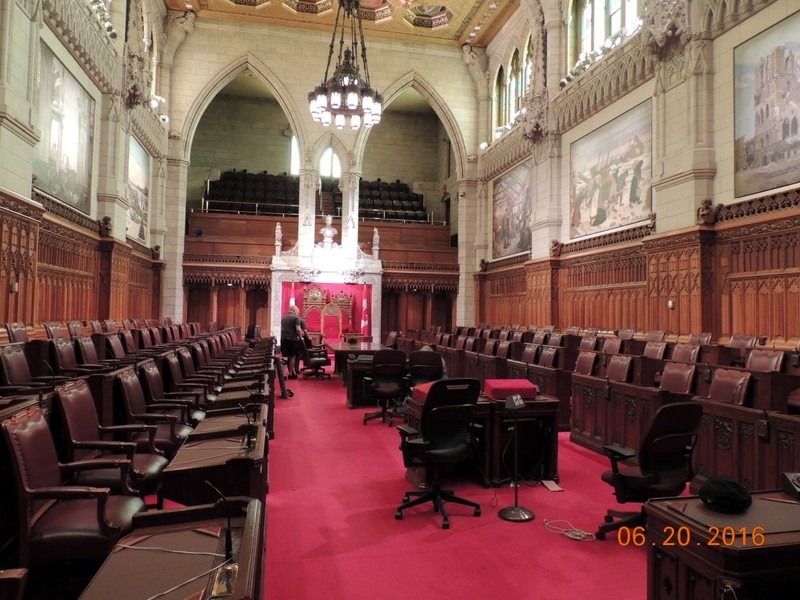 The Senate, above, is comprised of people who are appointed, not elected. 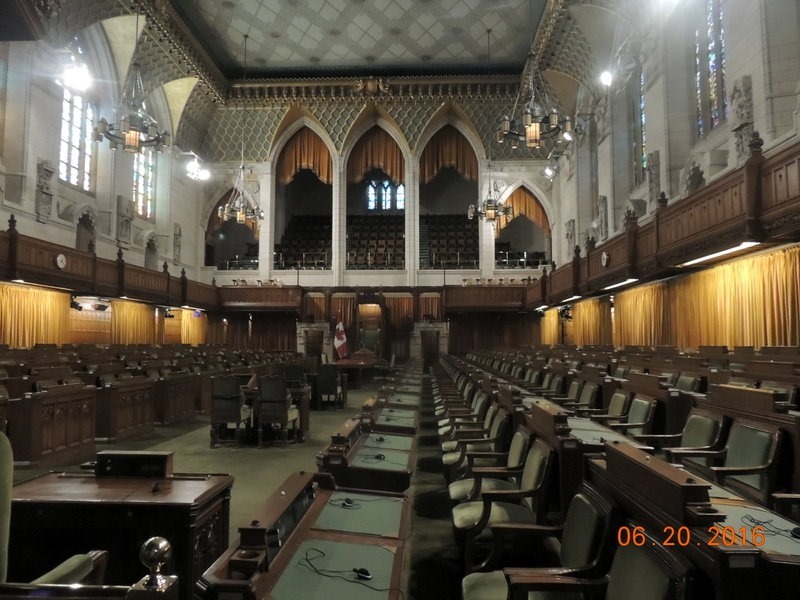 Note that the seats are more comfortable than the ones in the House of Commons. There are less of them also. 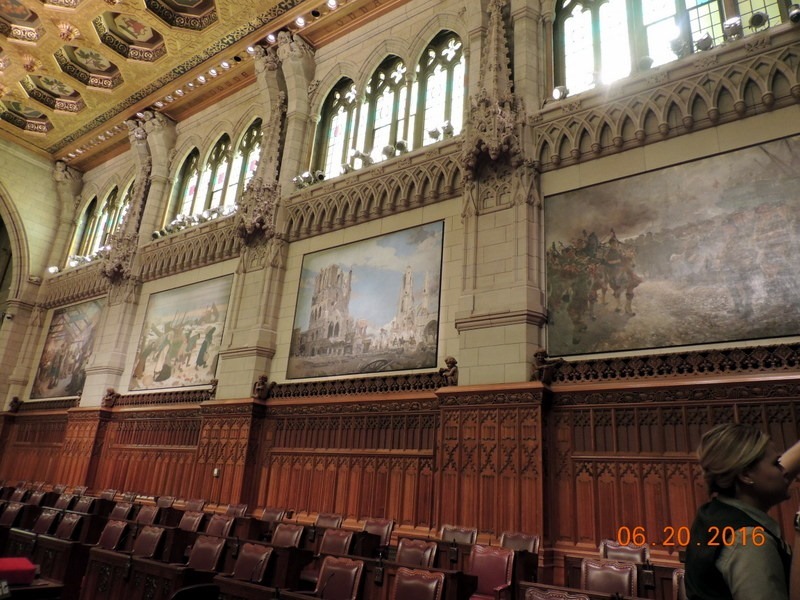 The pictures on the wall above were lent to the Senate over 100 years ago by the Museum of Fine Art. They don’t think they will ever be returned. 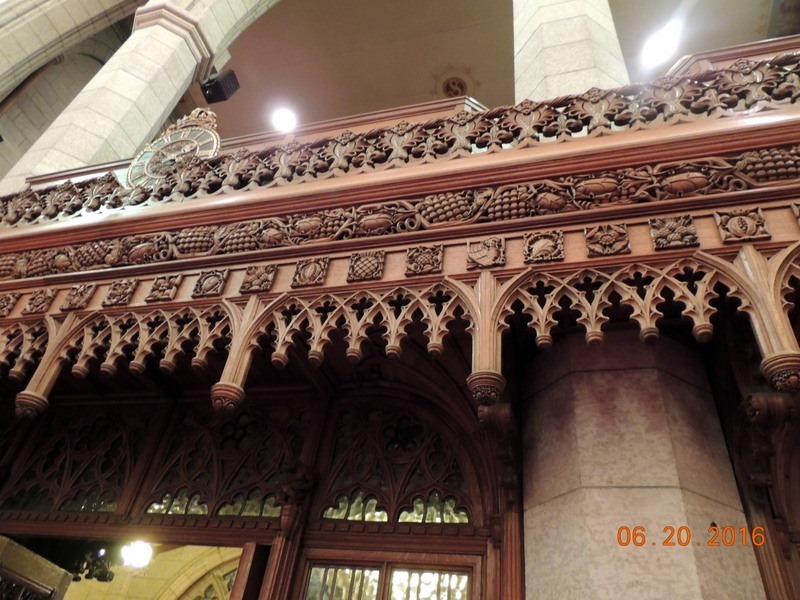 The wood work was beautiful. 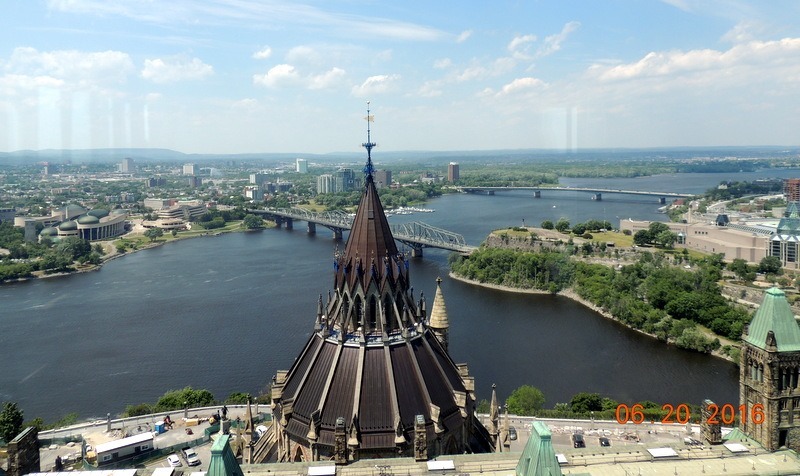 We rode the elevator up the Tower of Peace, which is the clock tower. The tower is 27 stories high, but the elevator goes up to almost the top, but on the buttons it is the 9th floor. What is in between are the 58 bells, which ring every 15 minutes. We lucked out and went up at 2:15, right as they were ringing, no not deafening! At the top you can see most of the city. 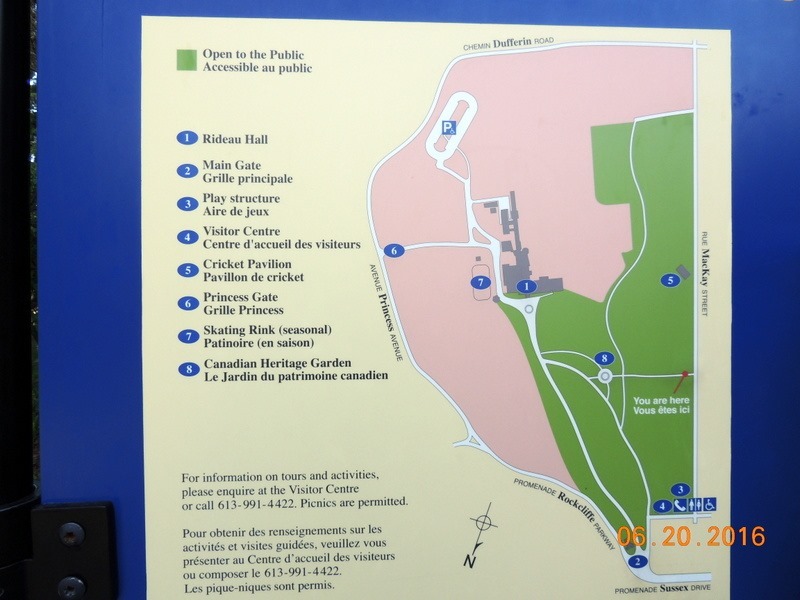 We could see Rideau Hall, straight ahead just before the dark green area. 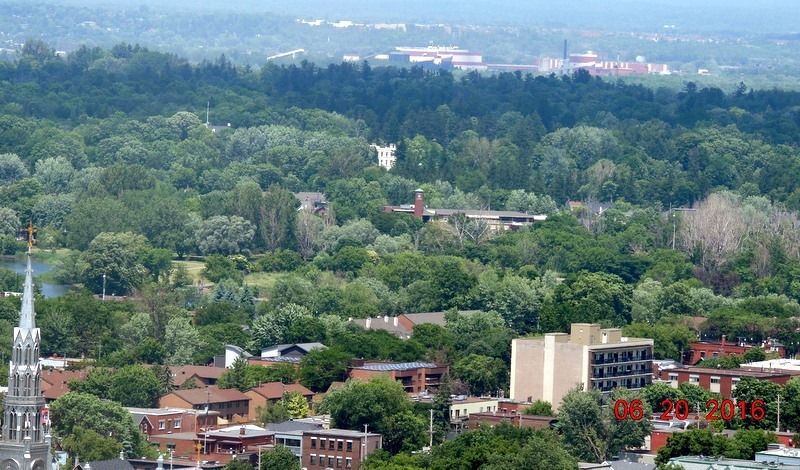 Above the St. Lawrence River and the American Embassy, below. And the spire from the Parliament Library. We could also look straight up at the clock above us through some ceiling windows..
Then we went to the Memorial Hall, which is a memorial to the dead from various wars. It only went back to an African campaign in the early 1800’s. There was nothing commemorating the Indian Wars in the 1600’s where my ancestors fought. We left and slowly weaved our way through traffic, as the traffic is mostly at a standstill! We stopped at Costco for a few things. We arrived back to the MH and the dogs were very happy to see us. We had a quiet evening. Tuesday- Moving day. We left the RV park at about 10:30 and went north a bit to a gas station. We purchased gas and diesel. Gas for the car was $1.03 liter, which is about $3 /gallon. The diesel was $0.93 per liter or $2.71 gallon. 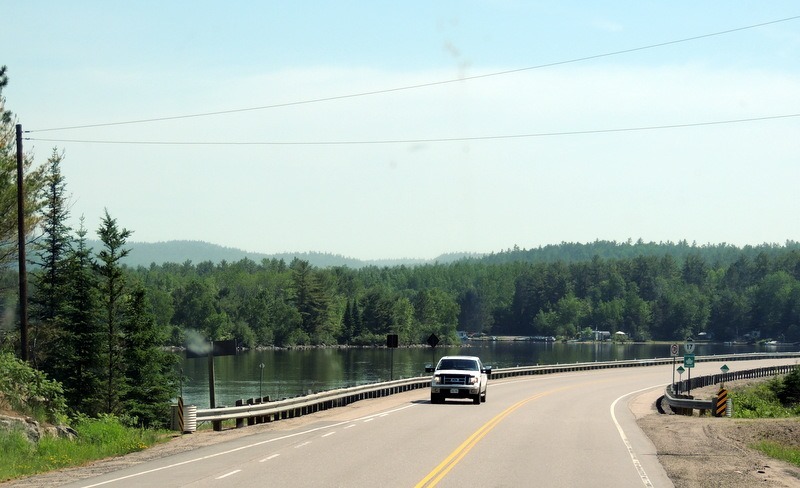 We drove back out to the auto route, which is their version of an interstate, and continued into Quebec. We stopped at the Visitor Center, where we spent almost an hour. We ate lunch, then went into the center, where they gave us lots of brochures and maps for the areas that we will be traveling over the next few weeks. We continued on our way, turning south onto I-15 which took us to Saint.-Jacques-le Mineaur, and Camping Lac Mineur RV Park. We checked in and the gal was busy on the phone, so she just pointed us to our site and told us to return later to pay her. Wednesday- We left a little after 8 AM and drove north on I-15 to I-10 and into town. It started raining, hard, on the way, but the weather is supposed to clear up quickly. There was terrible traffic. but at least drivers are polite. It is interesting, in Ontario, all signs are in English and French. In Quebec, English signs are rare. It takes us awhile to figure out what they are saying, especially since we cannot use our Google translate. We went straight to the Visitor Center, which is also where the Grayline Tour is located. We parked in the parking garage, under Dorchester Square. $16 for the day. This was a double decker bus tour, $55 each, for two days. They did not sell tickets for 1 day, but it is hop on hop off. We boarded the bus at 10 and rode around the city. We got off the bus at the Central Library. We went in and used the facilities, then went to the information booth. They sent us to the second floor, for the Genealogy section. As we entered, we had to leave our backpack in a locker, with Bob leaving his drivers license for security. Then I asked the Librarian for my fathers family. 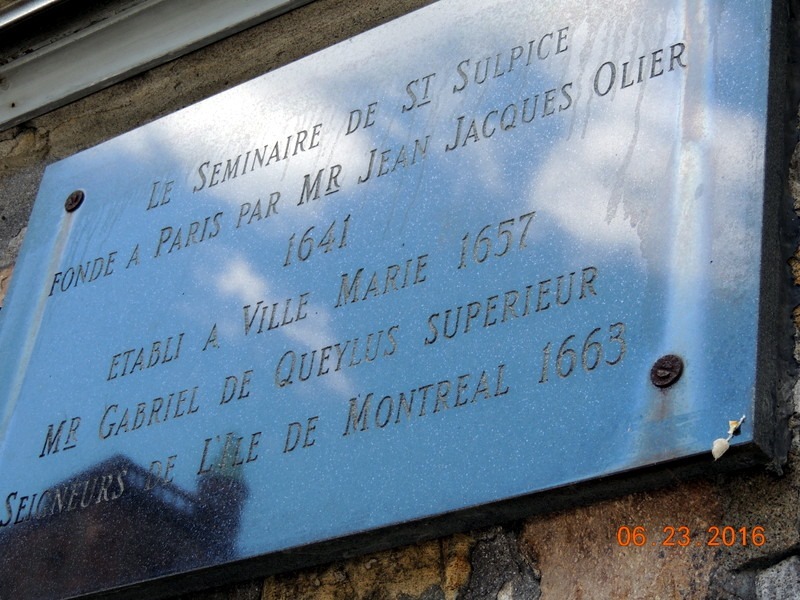 Unfortunately, no one has written a book on our family,yet, but he did find the first male in the family, Mathurin Lorion, in a book titled, Biographies of the Founders of Montreal. Cool! It is in French, so I will have to work on translating it later. Yea for Google translate! We checked the place out and plan to go back this weekend. We boarded the bus again and continued our journey. Below is a mail truck! 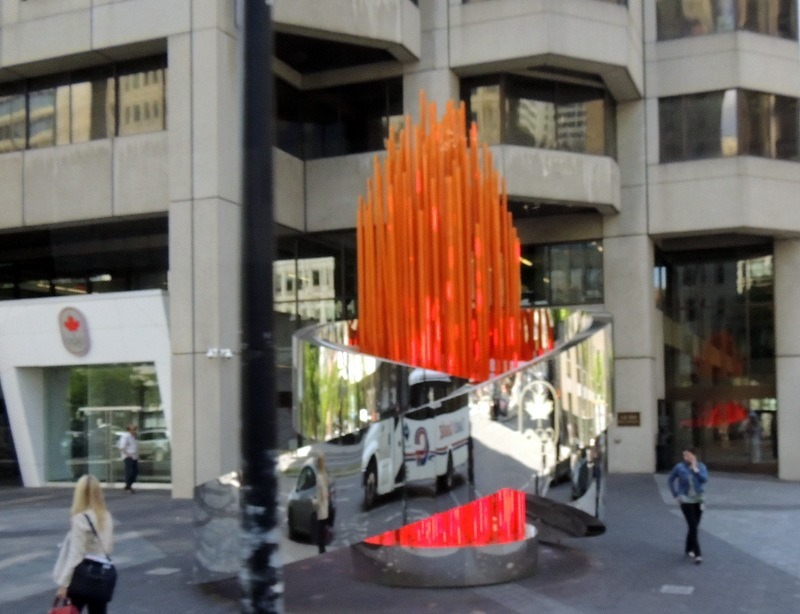 Above is a Chilully sculpture which was purchased by the Museum of Fine Arts after a Chilully exhibit in 2012. In the winter there is a glass enclosure that is placed around it to protect it from ice and snow. 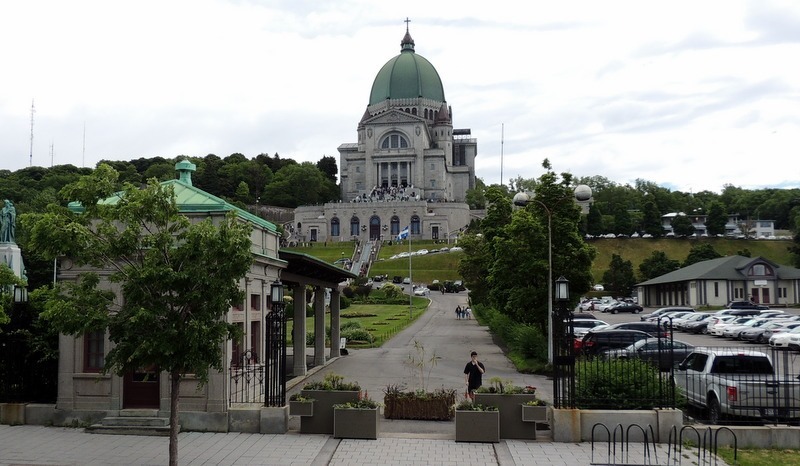 Below is L’Oratoire Saint-Joseph du Mont Royal. The steps on the lower front are where pilgrims enter. The center of the step are reserved for people who climb up on their knees in penance. There was someone climbing when we were there. We stayed on the bus, as we were running out of time. Above are pictures of one side of the city from a tour bus stop. The building is the Olympic Stadium. The bus tour was about 2 hours total. We returned to the original station where the car was in the parking garage. We stopped for a late lunch at Dunns Famous Restaurant. I had a honey mustard salad and Bob had a beef sandwich. 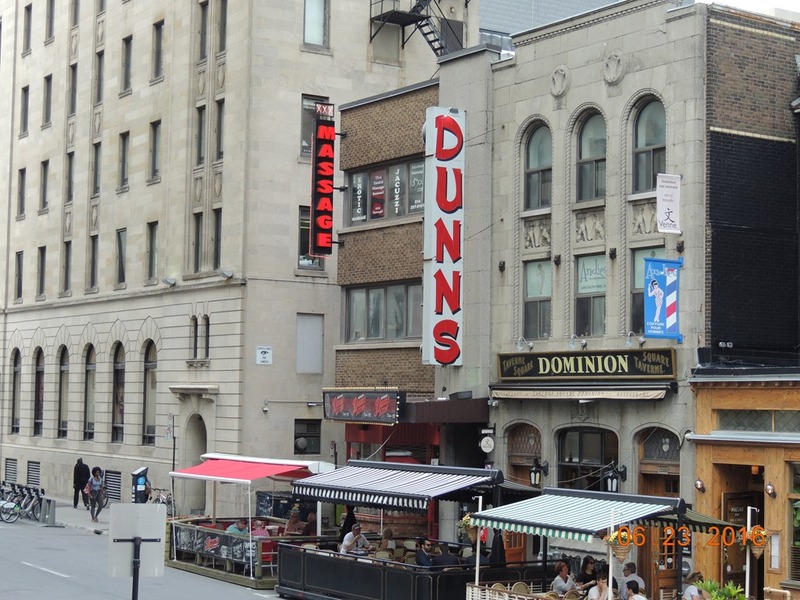 Dunns specializes in smoked meats, a favorite in Montreal. After lunch, we walked down to the Marie-Reign Du Monde Cathedral. We walked back through Dorchester Square. 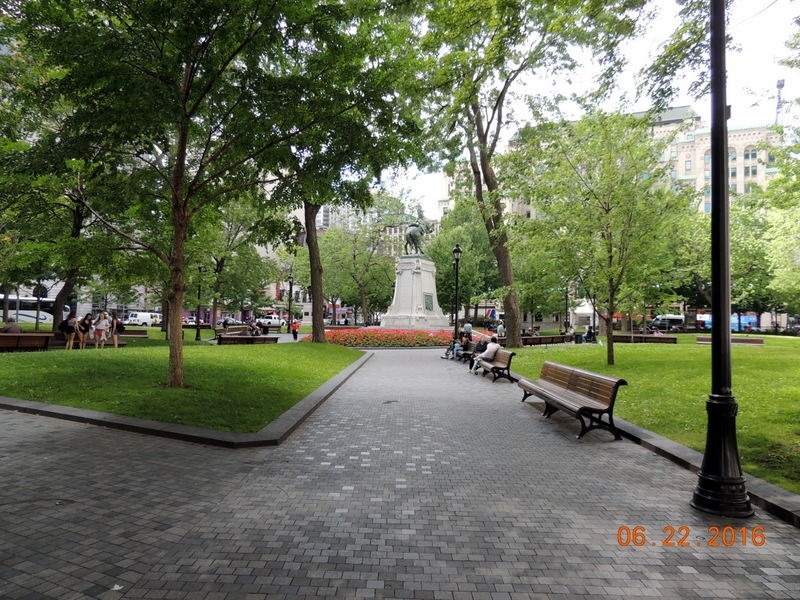 The square was originally the first cemetery in Montreal. Some of the bodies were moved to the new cemetery, but not all of them were moved. In 1854 there was a Cholera epidemic, which killed many people. They were afraid to move the bodies of those people, in fear that the disease would spread again. So many bodies are still there. We are parked under them! The sad thing is, some may be relatives of mine. Have to research that, but I did find one grandmother, several generations back, that died that year. Another mystery to solve! We left and went to Walmart. Or at least we tried to… The GPS kept having problems getting us there. We finally arrived and shopped. We returned home and watched TV, ate dinner and went to bed. 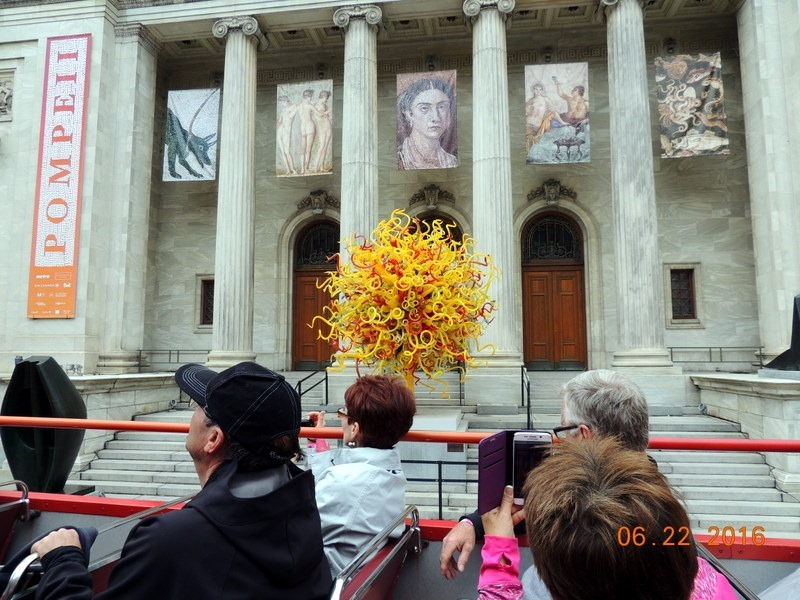 Thursday- We are going to use our second day of the Grayline tour to visit more of the city. We left an hour later and there was a significantly less traffic, mainly because tomorrow is Quebec National Day, a major holiday. Bob took this picture from the bridge on our way into town. 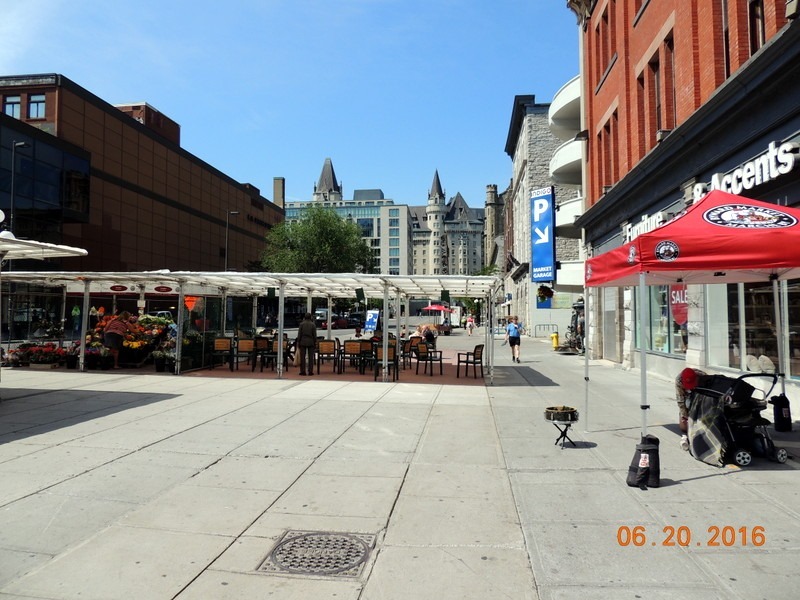 We repeated our drive from yesterday, parking in the same lot under Dorchester Square. We boarded a bus today, as the double decker bus travels on the hour, on the 30, and 45. They use a bus for the 15 after the hour. Today I was able to catch a picture of the Olympic Flame monument from the bus. This is their small Chinatown. We left at the first stop, the Basilica of Notre Dame. We paid $5 each for the tour. 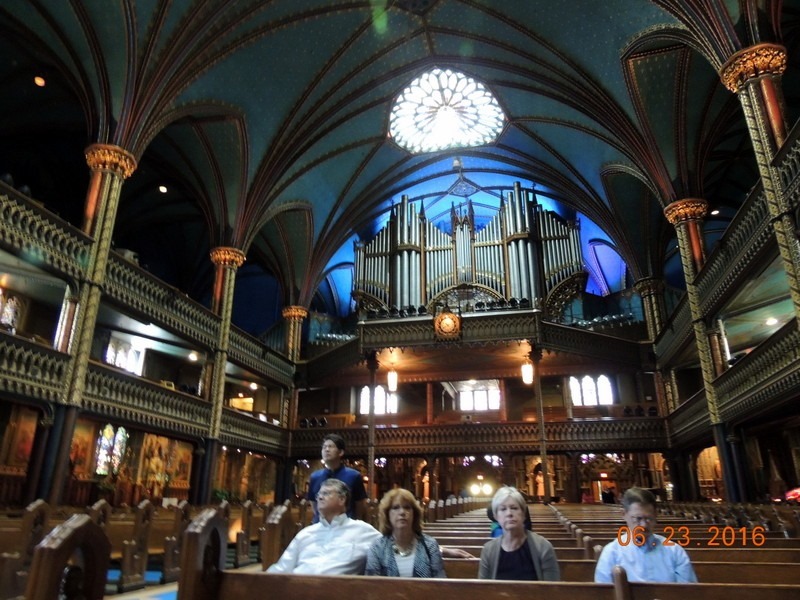 There was a tour just starting in English when we arrived, so we sat in the pews learning about the Basilica. 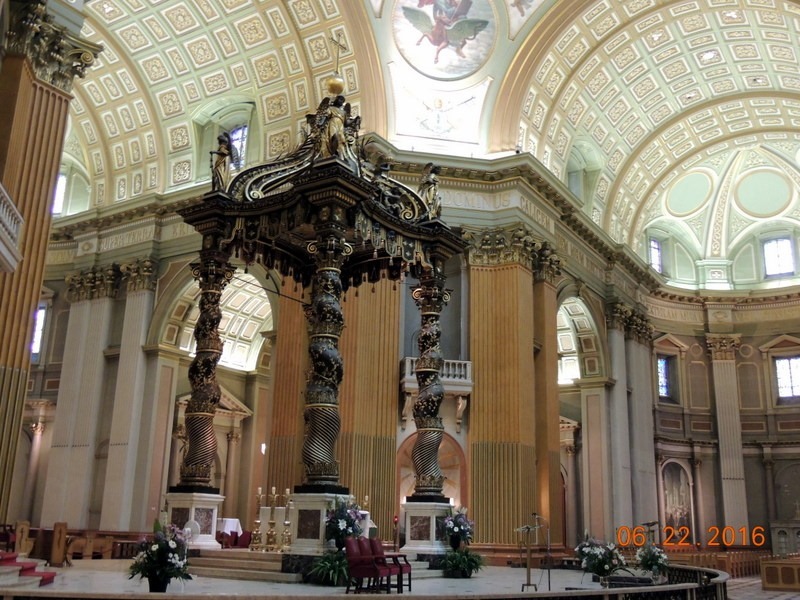 A Basilica is a church granted special privileges by the Pope. In this case, it is the highest church in Canada. 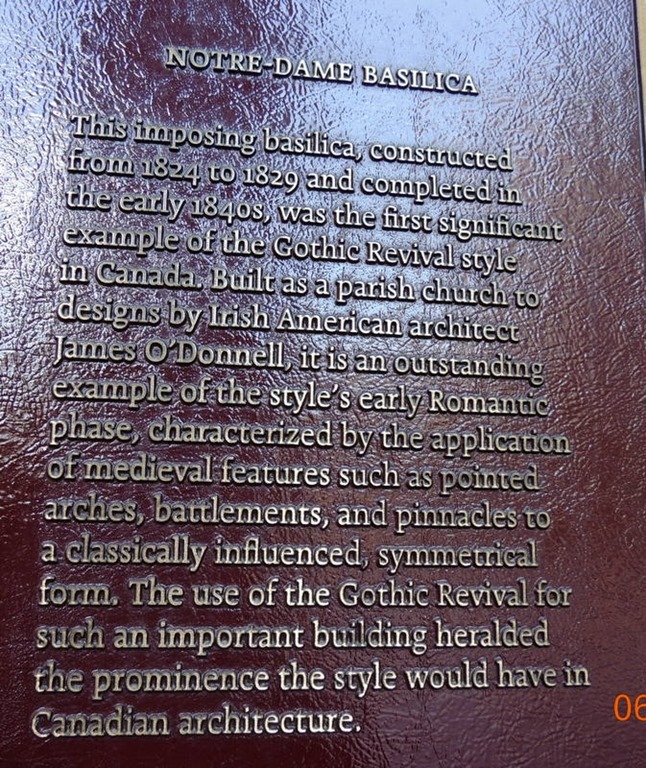 A Cathedral is usually the residence of the Bishop, and would normally outrank a Basilica. 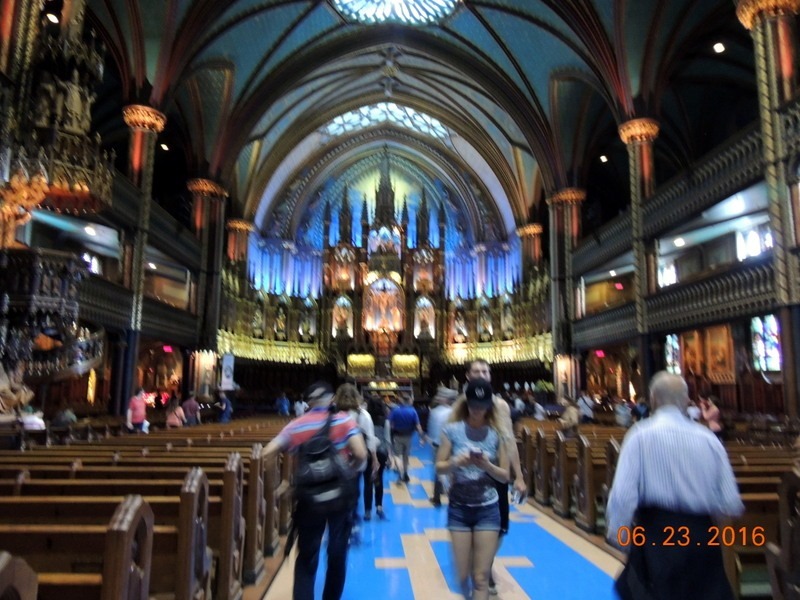 Notre Dame parish was founded n 1642. 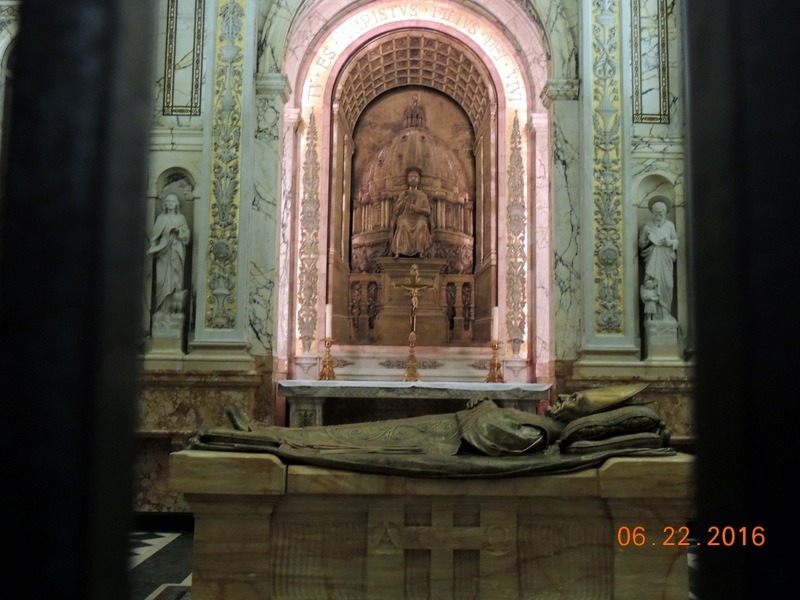 Up until 1659, Mass was celebrated in a modest wooden chapel, located on the square in front of the Basilica. The construction took place between 1672 and 1683. In 1823 the church was enlarged. 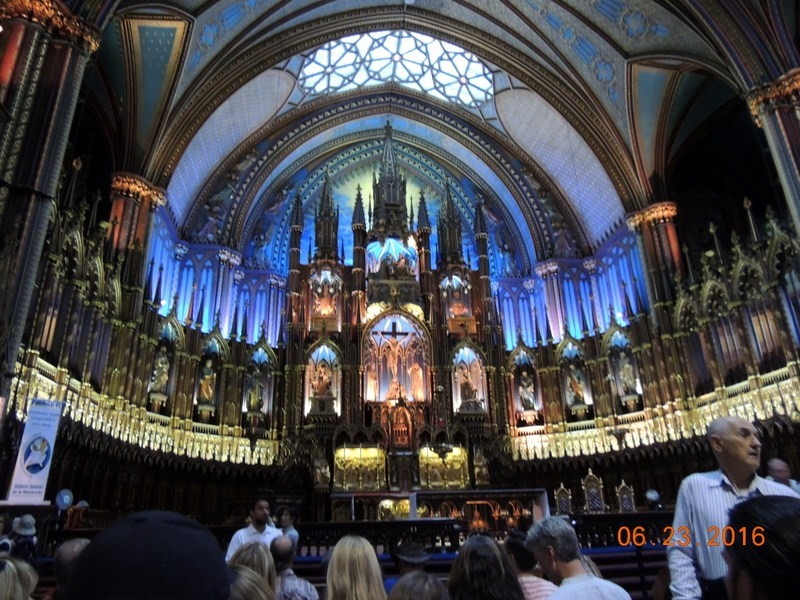 The inspiration for the spectacular inside of the church was Sainte-Chapelle in Paris. The organ above was built in 1891. It has 4 keyboards, 99 stops and approximately 7,000 pipes. We toured the inside. 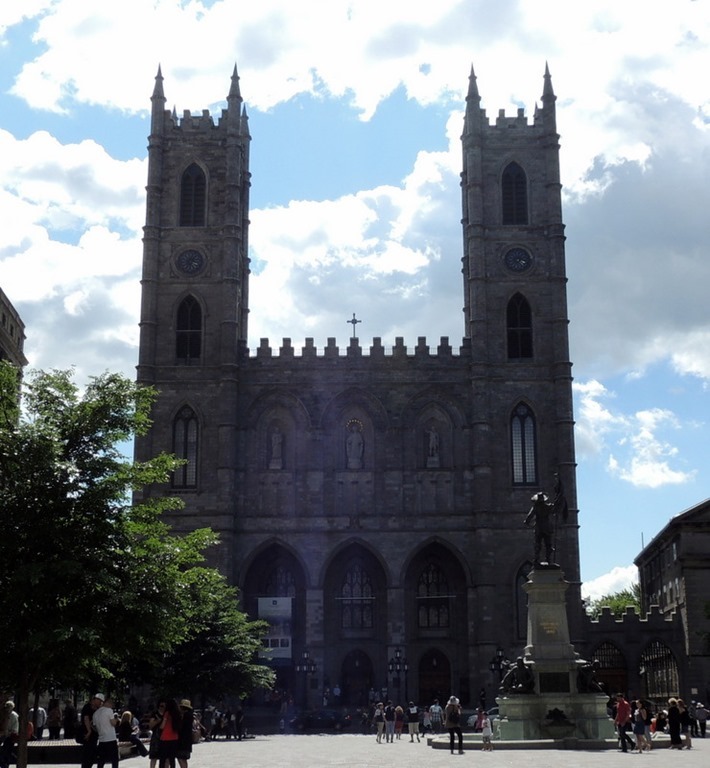 Our guide told us the history of the Basilica and some Quebec history. 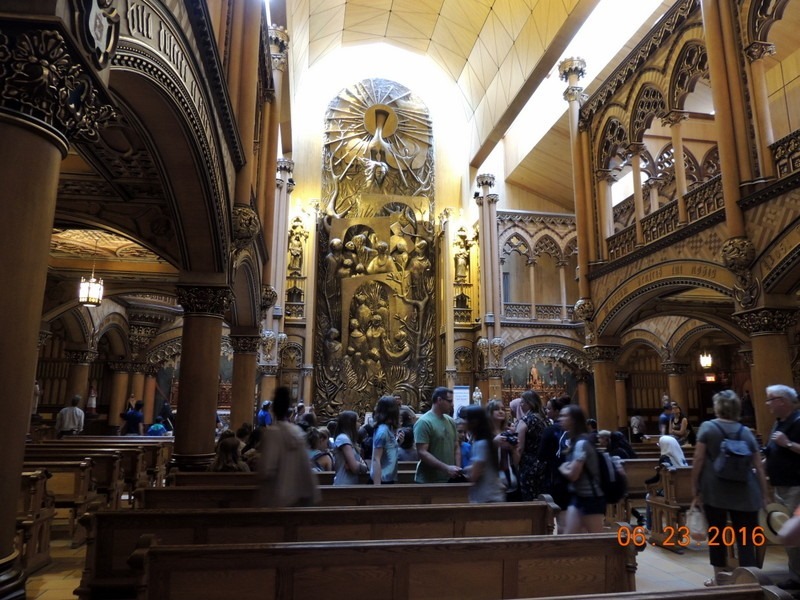 The tour guide took us to the rear, behind the alter to the Chape of Notre-Dame du Sacre-Coeur. This area was built between 1888 and 19891. The impressive bronze sculpture is symbolizing the march of human kind toward the Holy Trinity. The chapel is used because it is smaller and less intimidating. 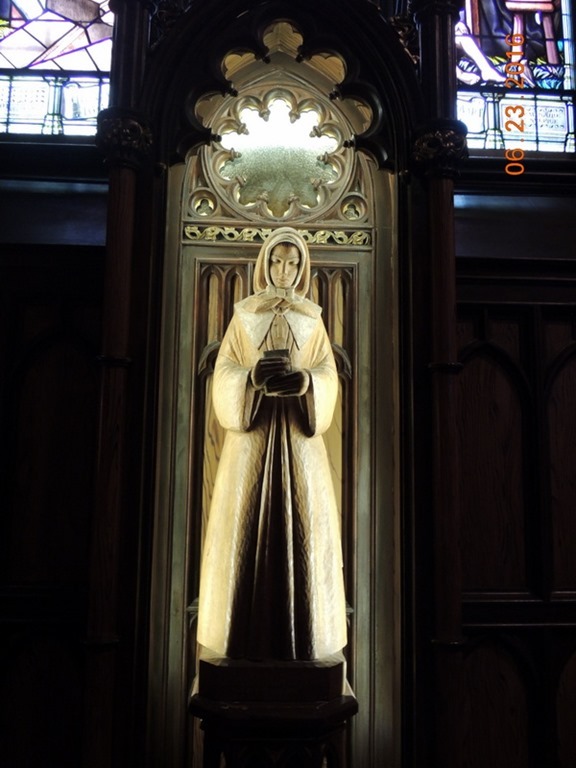 The statue above is of Marguerite Bourgeoys, the founder of the Sisters of Notre Dame. The sisters were the order of teachers at my elementary school, St. Agnes, in Arlington Virginia. 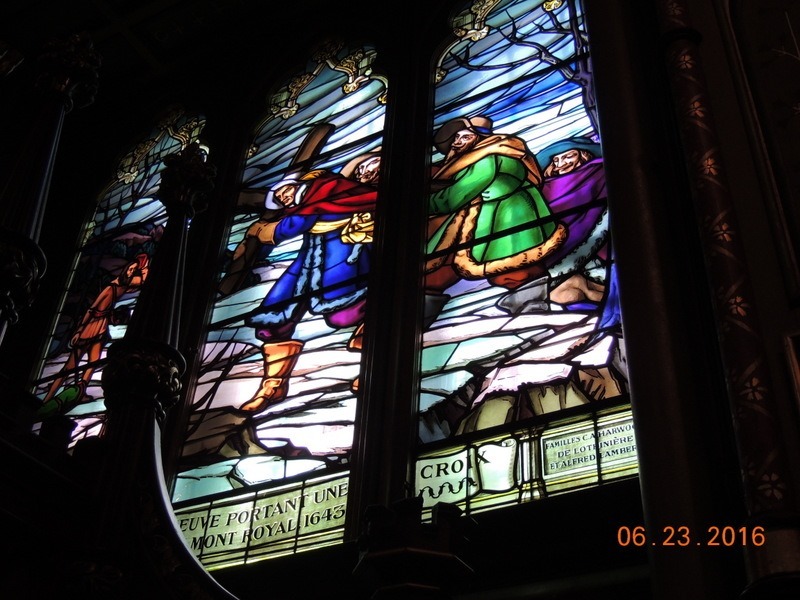 The tour guide told us about the stained glass windows which show the history of Quebec. 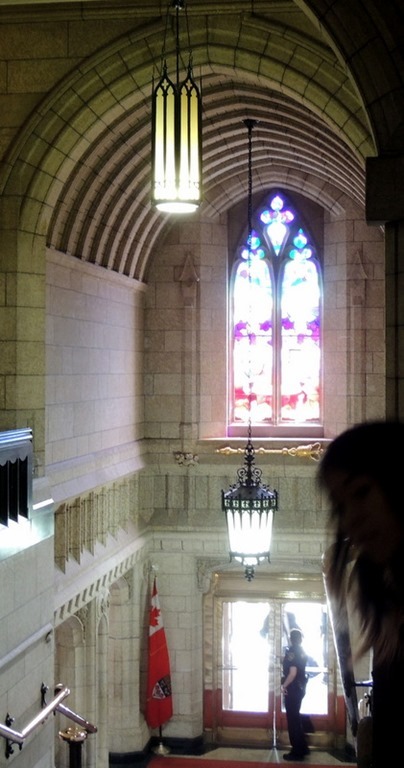 Above, the stain glass window commemorates the co-founder of Montreal, Paul Chomedey de Maisonneuve. The next stained glass is of Jeanne Mance. She came to “New France” to assist with colonizing the are for the King. 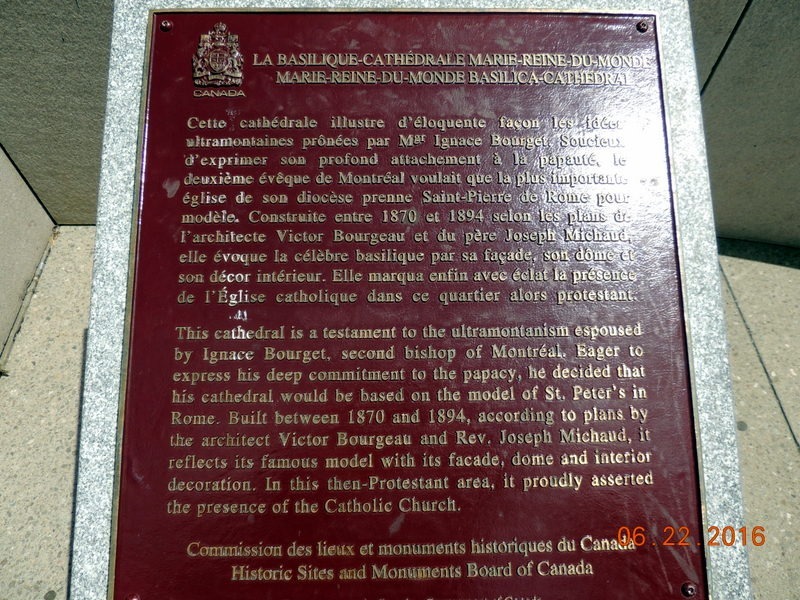 She is celebrated as the other co-founder of Montreal. She is the one who chaperoned Catherine Lorion, my half ancestor, who is one of the Femme Mariniers, a woman (16 years old) who immigrated to Montreal in 1654.The Femme Mariniers were before the Kings Daughters, a famous group of women who the King of France gave dowries to immigrate to “New France’ and marry to settle the area for France. We walked back outside. This is a picture of where the original wooden church was located and possibly a cemetery. 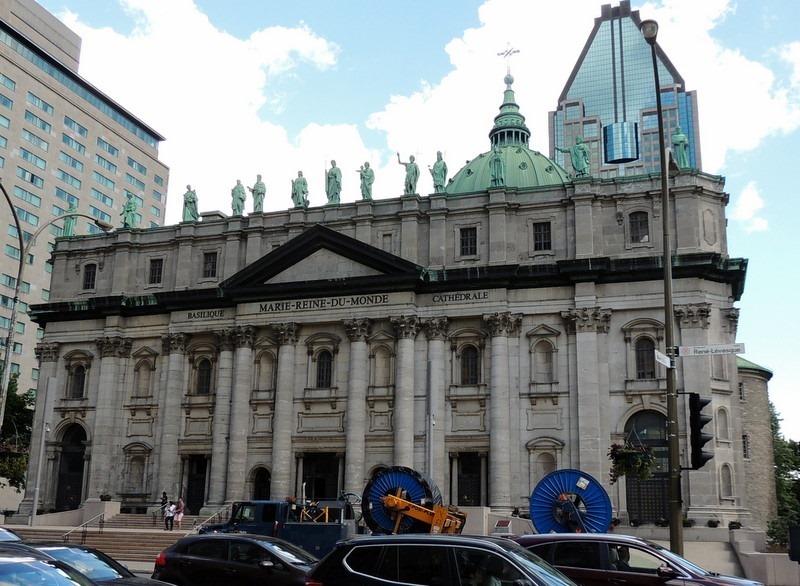 Next door and attached to the Basilica is the St. Sulpice Seminary. 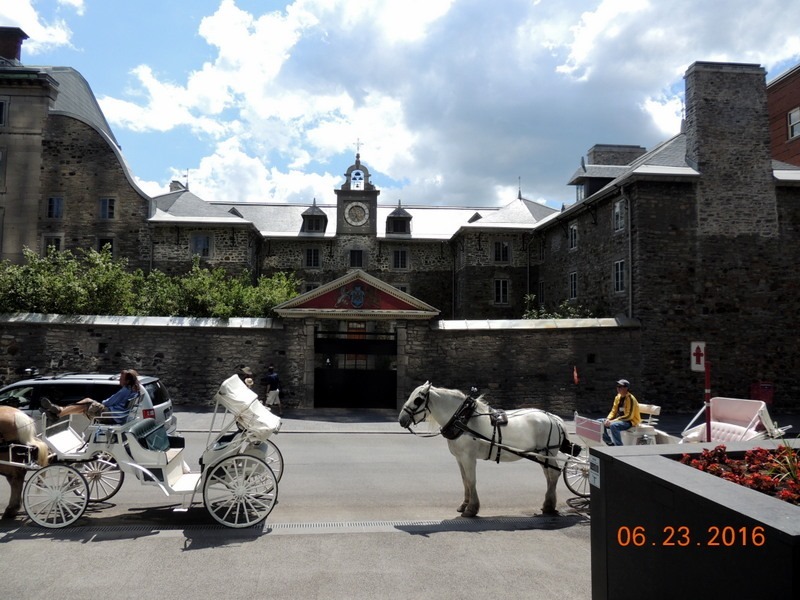 It is the oldest building in Montreal and I have ancestors who were married there. 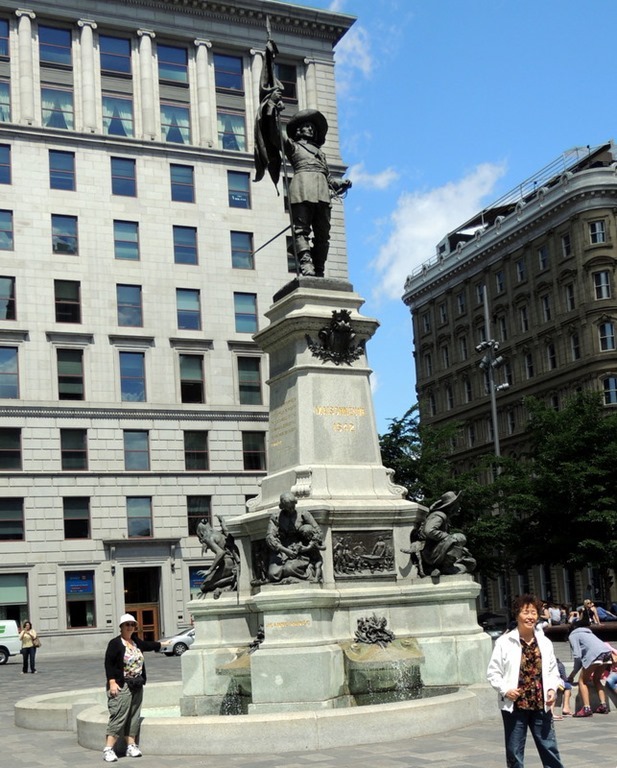 Above is also of Jeanne Mance, who built the first hospital in Montreal, which is still standing. We left and walked back down the hill. We rode a few blocks on the bus then hiked back up the hill to Chateau Ramezay. Chateau Ramezay is on the list of 1000 places to see before you die. 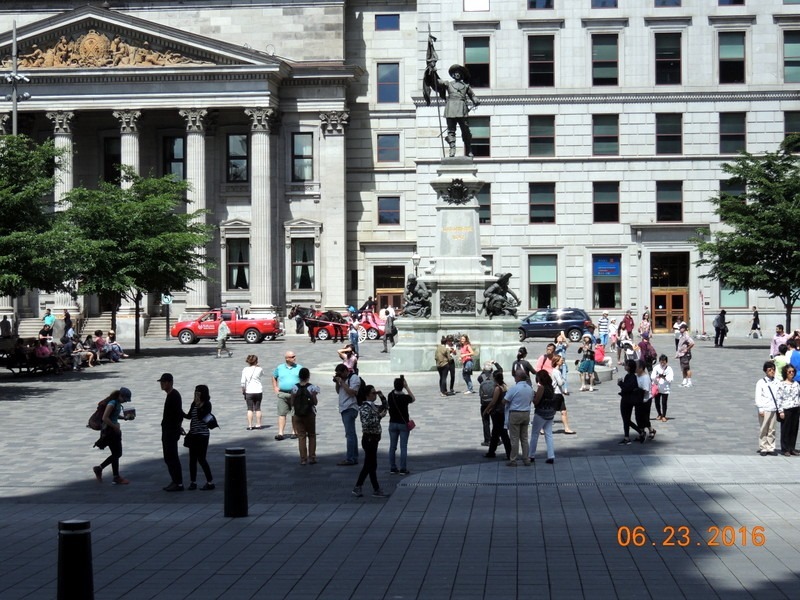 It is a famous museum, built in 1705 to be the residence of the Governor of Montreal. We paid $7 each to enter and tour. I have relatives who were married here, possibly in the room pictured below. 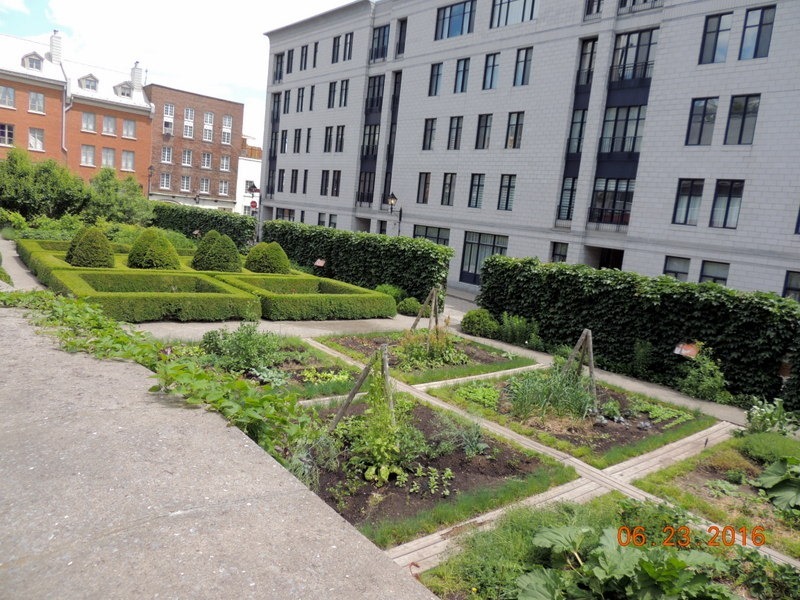 Or the garden out back. Originally, this was facing the river. We looked at the historical artifacts in the museum. 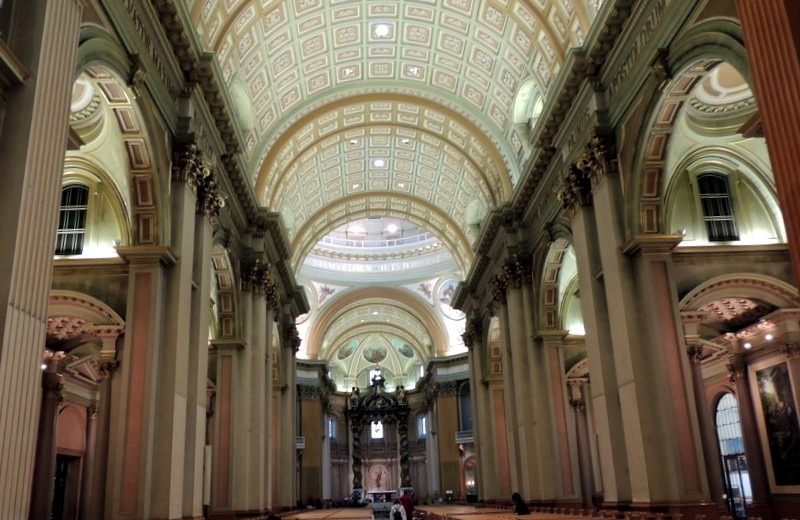 We walked about two blocks, back towards the Basilica, and went to lunch at Eggspectations. Bob had a panni and I had a crepe. We stopped after lunch, into the McDonalds across the street ,to see if they served poutine, which they did! We did not buy any, just wanted to see if they sold it as it is extremely popular in Quebec. We walked back down the hill and caught the bus again. We passed the Molson Brewery, which is the oldest Brewery in North America, still owned by the same family. 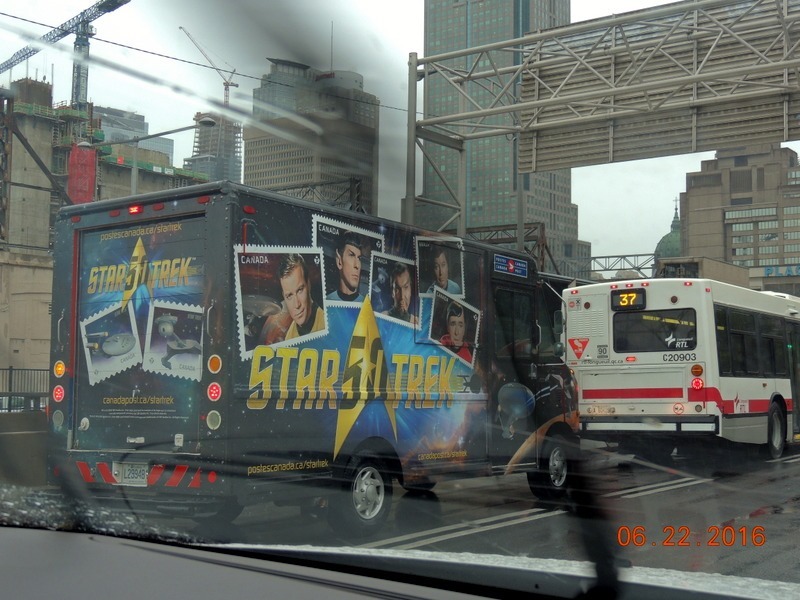 The tour bus took us into the Gay area of Montreal, which was pretty lively. 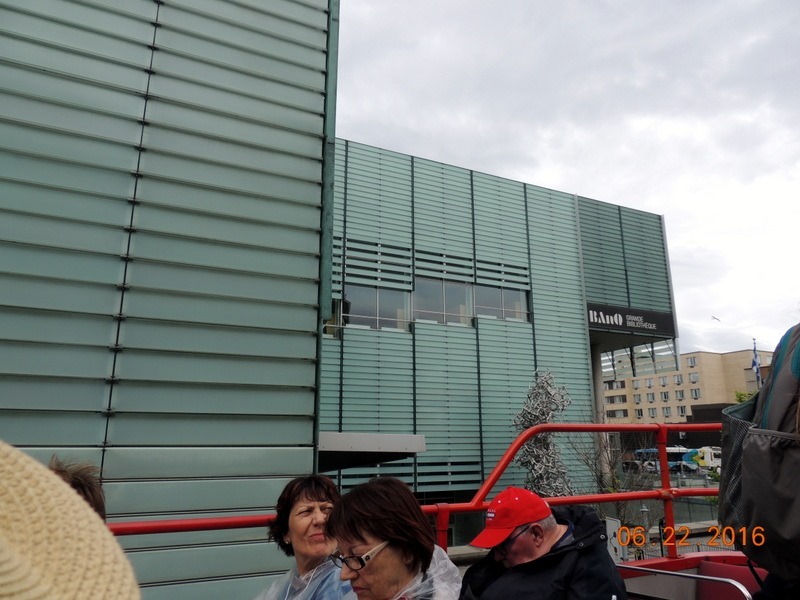 Then back to the Latin Quarter, which is where the Central Library is located. We stayed on the bus this time. 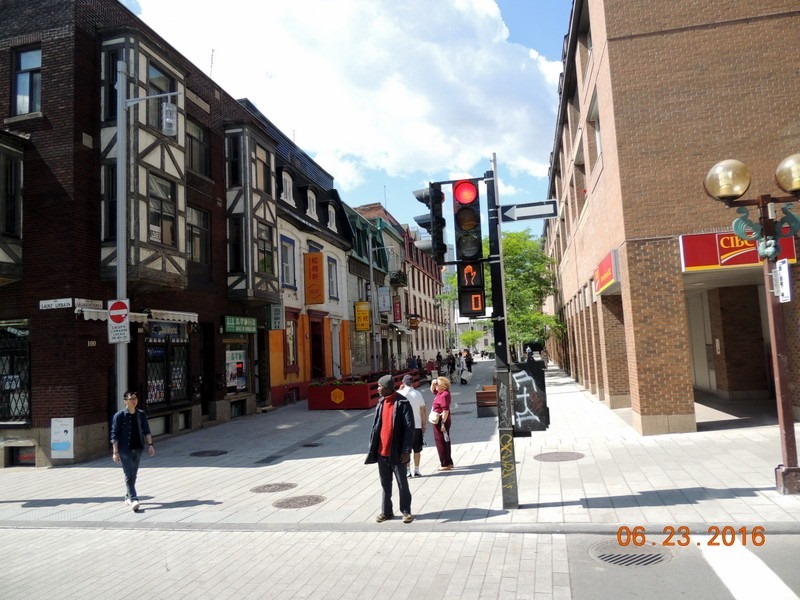 The Latin Quarter is called that because of the universities that are located there. 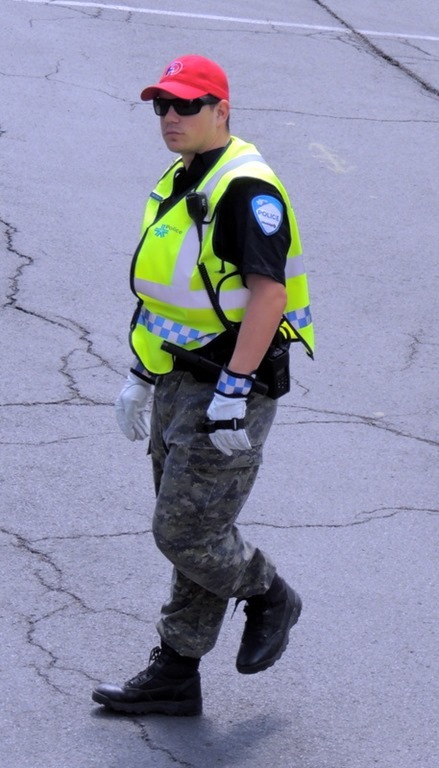 Above is a Montreal police officer. Note that he is wearing camouflage pants. Several years ago the government decided that they could no longer afford to pay for 80% of the police retirement fund. So they reduced it to 50%. The police, in protest, started wearing any type of pants that they want to wear. They still wear their uniform tops. Some wear jeans, it is just continues to be in protest. 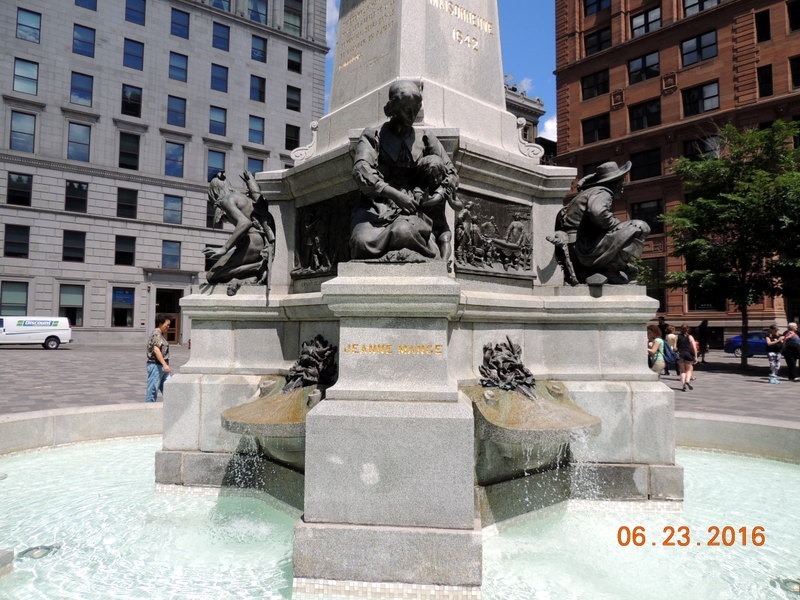 We continued on the bus tour back to Dorchester Square, retrieved the car, and left the city. We returned to the MH, ate dinner on the picnic table again, and sat out reading our books. 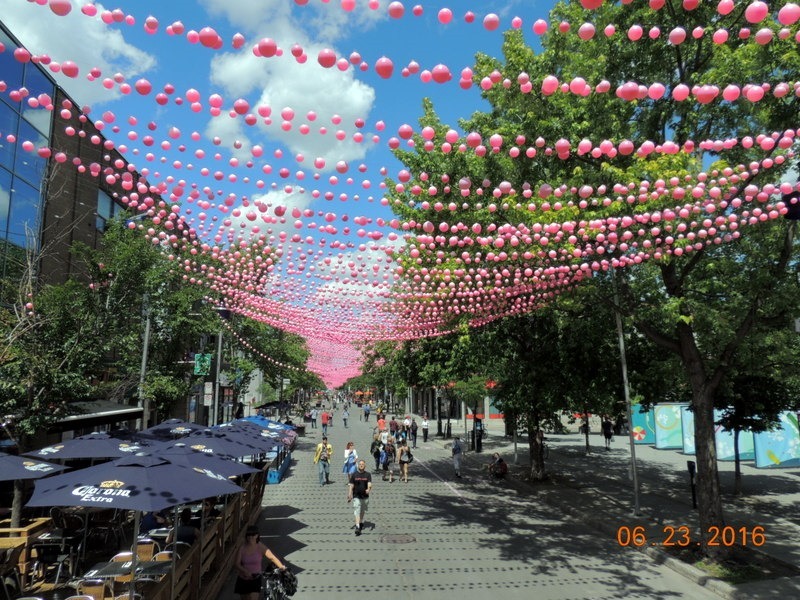 Friday- Saint-Jean-Baptiste Day (French: Fête de la Saint-Jean-Baptiste), officially known in Quebec as La fête nationale, (English: National Holiday) is a holiday celebrated annually on June 24, the feast day of the Nativity of St. John the Baptist. This is a 4 day weekend, and most everything is closed. There was a parade and free concerts in the evening, in addition to fireworks, which we could hear at the RV park. Moving day. We worked a bit around the MH, then packed up. We left the RV park at about 10:50. We drove back out to AR 15. We were to exit onto AR 30, but the GPS kept telling Bob to stay left. He did and missed the exit. The exit very clearly said AR 30 west, and we wanted AR 30 east. Quebec has really strange exits. You exit about a mile before your turn, using a limited access side road. Very strange and the each road is different with how it deals with this situation. This one exit has thrown us from both directions. So the GPS re-routed us sending us along side of the city of Montreal. Fortunately, it is the holiday, so there was minimal traffic, until we turned on to AR 20.. Once on AR 20, we traveled about 11 miles to Camping Alouette, a very expensive park, but closer to where we wanted to be located. This is the only RV park that I could find in the area. $63 per night for 3 nights. We pulled in and I went into the office. As I went to pay the gal asked about the dogs. I said we had 2. She said that would be $4 per dog per day. I said, WHAT? I had not been told of the extra fee. She waived the fee as I told her that we would not have made the reservation here if we had known about the fee. We pulled into our site, set up, ate lunch, walked the dogs, and left. We set the GPS for Cemeterie Saint-Enfant-Jesus- Pointe-aux-Trembles. My 9th Grandmother and Grandfather are buried there. ( I found them on Find a Grave). It was 22 minutes away. We arrived to find a terrible alley. Huh? So we tried again, and headed to a different destination, only to find that the GPS was sending us to the wrong place, again. Finally, Bob navigated us, the old fashion way, using a map. We finally arrived, after 3 hours, at the cemeterie. All the graves were more modern. We did not even find a grave from earlier than 1900. It was also not at the exact address, so we continued on to the church. We found a sign, which I photographed to translate later. Not being about to use my Google Translate because we are limited on data is a real issue! We left and it took 22 minutes to get back to the RV park! We had a quiet evening, We ate out on the picnic table after BBQ’ing some pork chops. The weather was wonderful, a slight breeze, temp about 80, low humidity.